Privacy, please. 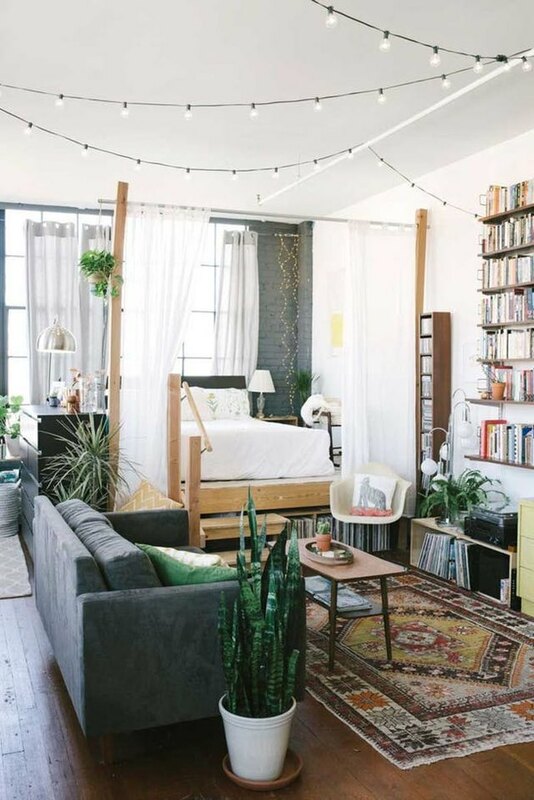 If you live in a studio apartment, we understand how hard it can be to divvy up a space that's already pretty small. But just because you live in tight quarters doesn't mean you can't enjoy having defined dining, living, and sleeping areas. 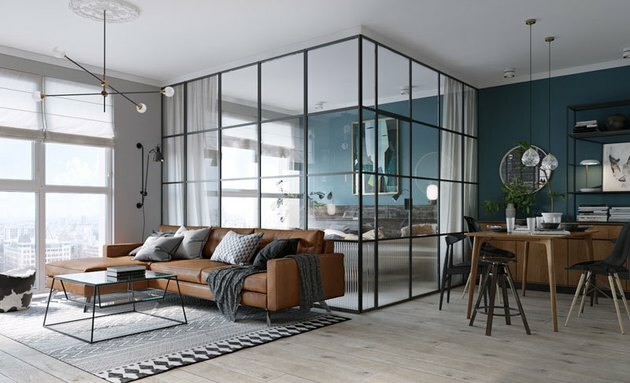 From temporary partitions to a plant-based divider, check out these nine uniquely modern ways to divide your spatially challenged digs. 1. Install a temporary partition. This gorgeous loft separates the bedroom from the rest of the home with a framed glass wall, keeping the whole space airy and light. If you're thinking, "Nice, but this doesn't really go with my space," there are still many varieties of temporary partitions you can install, with the help of companies like Room Dividers NY. Installing drapery might be the most cost-effective way to divide your tiny abode. And bonus: You can change the fabric as often as you like. Perhaps something sheer in the summer, and something a little heavier and more opaque in the winter? You can learn how to mount your drapery to the ceiling here. 3. Or, opt for beaded drapery instead. If you want something more transparent than opaque or semi-opaque drapery, try a beaded curtain instead. We just love this beaded macrame version that Emily from The Wicker House made for her home. Or, if DIY projects aren't really your thing, you can always buy one like this bamboo number from Urban Outfitters ( $69 ). 4. Consider raising the floor. One of the most awkward things about living in a studio apartment is having a bed in the center of the room. This apartment utilizes both sheer curtains and a raised floor to divide the bedroom area from the living area. Check out how to build a raised wood floor here. If you have room for a solid-back bookcase, this is an easy and functional way to divide your studio. It provides the privacy of a wall and gives you additional storage — what's not to love? 6. 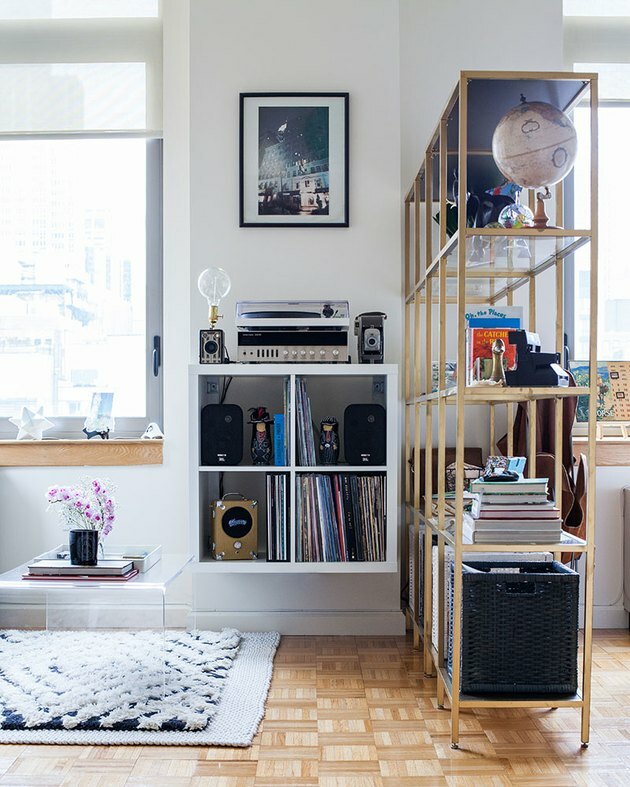 Or an open shelving unit. If a solid-back bookcase feels too bulky or blocks natural light, try an open shelving unit instead. 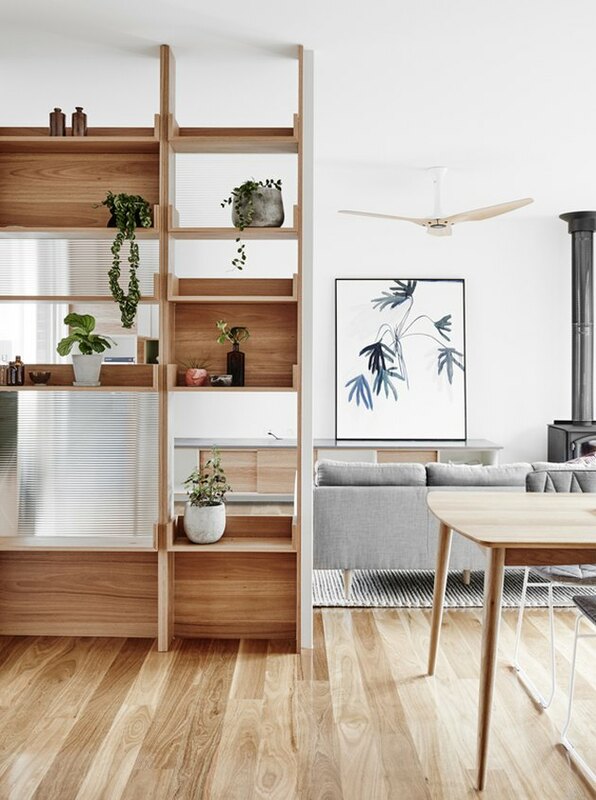 Similar to a bookcase, this option also provides storage and maximizes the height of the room, but it contains enough negative space that it won't make your home feel overcrowded. 7. Opt for a folding screen. If you're worried that a temporary wall or bookcase might make your studio feel even smaller, try a decorative folding screen. The woven pattern and airy design allows light to travel through, while still giving the sleeping area a hint of privacy. Plus, you can easily fold it up and move it out of the way, giving you enough room to do your fave Jillian Michaels workout. 8. Invest in a wardrobe unit. 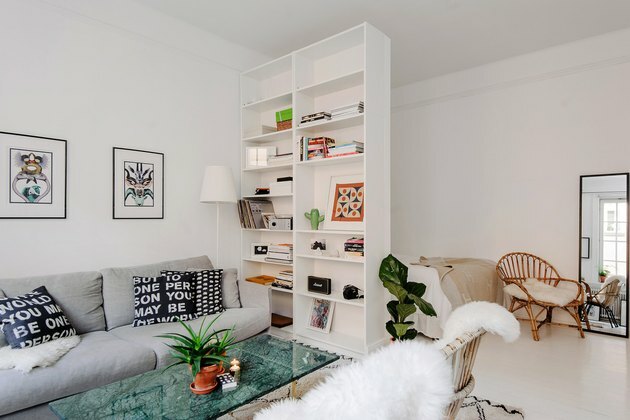 If you're lucky enough to have a studio apartment with a closet, rejoice. 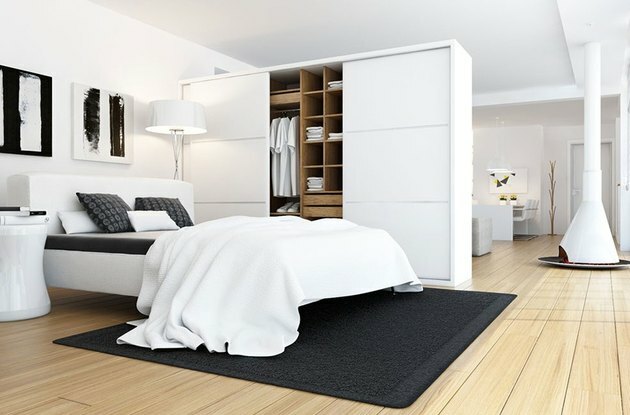 For everyone else, consider investing in a free-standing wardrobe that can double as a room divider. 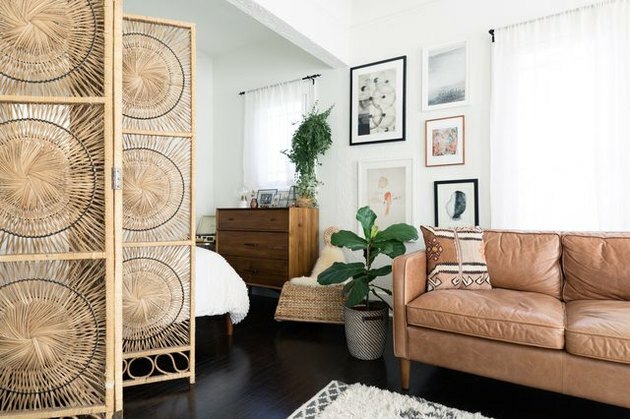 Due to its size, it almost feels like a wall — clearly delineating where the bedroom stops and the living room begins. 9. Create a living wall. Put your green thumb to work, and divide your space with some lush greenery. This fab idea will help clean the air in your tiny pad, plus it will add a nice pop of color. 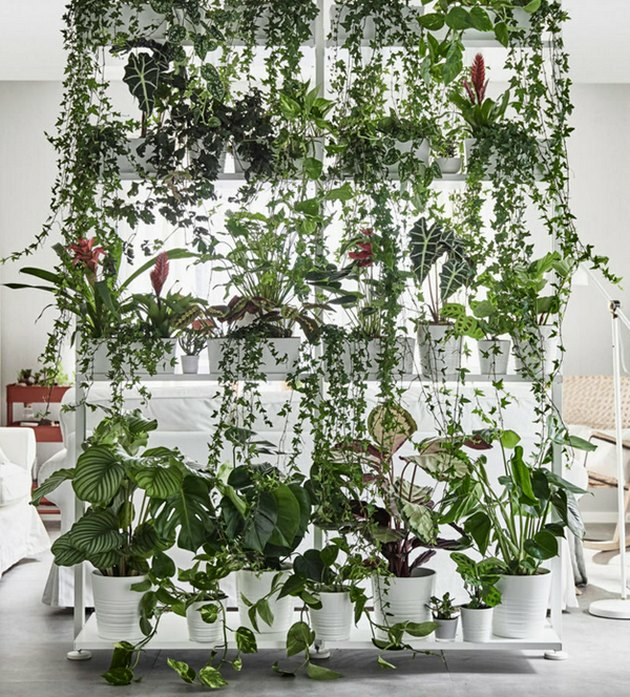 Learn how landscape architect Karin Svensson created this verdant jungle for Ikea here. Madison Vanderberg is a writer — mostly for the internet (HelloGiggles, Obsev, Racked), occasionally for the screen. 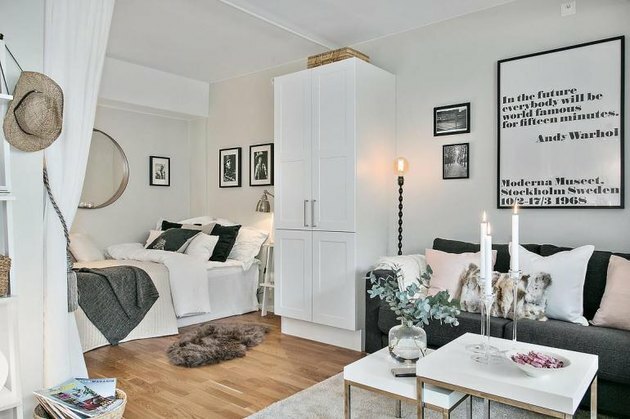 When she's not writing, she's following realtors on Instagram and daydreaming about her future Scandinavian-inspired home.